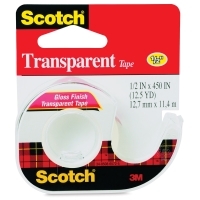 3M Scotch Transparent Tape is a clear, glossy-finish tape that’s perfect for basic household taping needs. 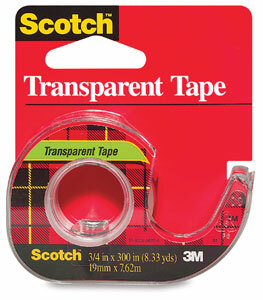 Use it as an invisible helping hand to wrap gifts, fix torn paper, and seal envelopes. It’s also safe to use with photos and other glossy surfaces. Transparent Tape comes in an easy-to-use, refillable dispenser, so the tape glides out and cuts to your desired length, without waste. It adheres instantly, with excellent holding power. Plus, it doesn’t yellow over time.